I wake up every morning and go straight into action. I’ve put aside trying to put in habits that were designed to fix myself. There’s nothing broken. Being organized. If you want to do something big, there’s not question. You have to be organized. Knowing who to put around me. This comes from knowing myself. What am I good at, what am I not good at? Look at everything from a more holistic point of view. Unpack all of the things that happen in your life and in your business. 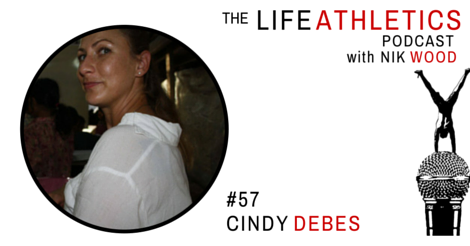 Today’s guest Life Athlete is Cindy Debes. Cindy is the founder of Hands Across The World. An organization that stands against human trafficking, forced labour, sexual exploitation and other injustices by bringing teachers, English instruction, and safety awareness to remote and rural communities in Cambodia. To organize people. To bring people together. To put myself in people’s positions. Today’s guest Life Athlete is Moshe Koz. Moshe is a trainer and practitioner of what he calls “conscious fitness”. He brings awareness and mindfulness to the practice of physical training and he invites his clients and anyone listening to join him in the paradigm shift. An ability to be there with people with empathy and to radiate compassion. Dale is a champion of purpose. He is the editor of the Good Man Project, has written and edited seven best-selling books, lived a life of adventure and now Dale helps men discover what they want from their lives and then empowers them to make a concrete plan to go do it. I can stack the deck in my favour. Believe that you can succeed. Do some form of physical activity. My sense of purpose and direction. Intention – Put intention around that Super Power. What is the answer to “Why are you here”? Imagine – Set an imaginary set of goals for yourself. Do a time travel interview – imagine that you’re talking to your future self and have them tell you what your life was like. Interconnect – Surround yourself with the people who pull you or drive you to be your highest self. Today’s guest Life Athlete is Patrick Brown. Patrick is a member the world champion barbershop ensemble, The Toronto Northern Lights. He’s an engineer who has brought a scientific and analytical mind to the arts and an artistic mind to sciences. -Confidence: Embrace failure. Experience it and move on. -Selflessness: Try doing something for somebody and go from there. Today’s guest Life Athlete is Amy Jones. Amy is the founder of two websites: The first, mapyourprogress.com offers drawings Amy has created to help humans visually track their progress toward a goal by coloring in parts of the image as they take steps forward. The second,sanctuwherewe.com is an online safe haven where humans can safely and anonymously share things that are hard to talk about. –Listen to the good ideas that you have and write them down. or get Siri to send you emails from yourself. The ability to speak my truth and to be vulnerable. Today’s guest Life Athlete… well… today’s guest Life Athlete is ME! For this episode I’ve slid one chair over and am playing guest while the wonderful Derek Loudermilk, the host of the Art of Adventure podcast, takes over the hosting duties of Life Athletics. You, the listeners were asking for me to answer the questions I normally direct at my guests and I heard you. Enjoy! Do what works. This is context based. Connect things. Find deeper meaning in the similarities between seemingly disparate things. Reframe things: Tell the story that works for you. Everything is an opportunity to train myself to be the me I want to be. Do the things that you know will benefit you that might be hard, or uncomfortable. Learn to love yourself. Forgive yourself and then share that out with the world. Today’s guest Life Athlete is Elora Hardy. Elora is the head of Ibuku the world leader in Bamboo construction. What they do is create architectural dreamscapes out of Bamboo. Here she opens up vulnerably and courageously about her, process, her journey, and her passion… all only days before the birth of her first child. The ability to enhance people’s enthusiasm. 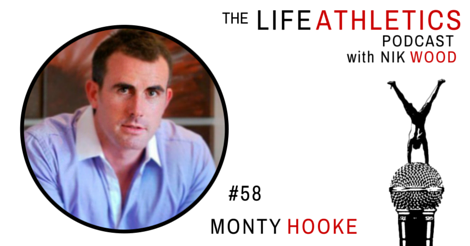 Life Athletes, hello and welcome to episode 45 of the Life Athletics Podcast. Today’s guest Life Athlete is Neil Cannon. Neil is a snowboarding, kite surfing, world traveling fitness nut. Through his company, Mojo Multiplier he is coaching and supporting men to get into peak physical shape, optimize their hormones, and increase their testosterone completely naturally so they can get their mojo back. Health is my number one priority. Get clear on why you want to make a change. Life Athletes, hello and welcome to episode 44 of the Life Athletics podcast. Today’s guest Life Athlete is Tah Riq. Tah Riq is an award winning speaker, artist, flamenco guitarist. His music has been featured in TEDx, he has a TEDx talk about leaping into the life you want, he’s a black belt in Karate and he’s the founder of the Superhero Factory a parkour gym in Bali. Never tell yourself that there’s anything you can’t do. -No matter how seemingly unreachable a goal, remember that it is only a series of steps in that direction that will get you there. Come to the Superhero Factory and work through any blocks on a physical level. Look for the joy in what you do and remember why you began. Today’s guest Life Athlete is Katrina Hadden. Katrina is a real estate agent, personal coach, health advocate and model. In everything she does she strives to bring out the beauty in situations and to empower others to see the beauty in themselves and in the world around them. I work out at the day 3-4 times a week and I’m very cautious of how I fuel my body. I would encourage people to release their fear. Today’s guest Life Athlete is T.K. McLennon. T.K. is the brain behind the book Trailblasian: Black Women Living in East Asia. Toronto-born T.K. McLennon is a former assistant professor of International Studies in South Korea, and a former Management Studies instructor at a university in Toronto. She is also the founder of Culturiousity.com. -Early to bed, early to rise. -Wake up, put on the kettle and drink hot water and lemon. Learn to listen, actively. Have a genuine desire to hear people. Be present. Power vs. Force – David R. Hawkins M.D. Ph.D.
Today’s guest Life Athlete is Henare O’Brien. Henare is half of the dynamic kiwi duo Henare and Kate. Together they transform the lives of hundreds of people at their game changer live events and thousands more around the world. Henare went from a bruising, boozing, skirt chasing professional athlete brute to a soft talking, eager to hug, spiritual and emotional coach and guide. His story of transformation is a gift for anyone looking to overcome their baser nature. Today’s guest Life Athlete is Kate O’Brien. Kate is half of the dynamic kiwi duo Henare and Kate. Together they transform the lives of hundreds of people at their game changer live events, which are Fast Becoming Known As NZ’s #1 Coaching & Training Intensive and thousands more around the world on-line. Kate’s journey is almost impossible to believe looking at her now and is an inspiration for anyone who thinks that they might have fallen too low to turn it all around. Today’s guest Life Athlete is Loic Lopez. I heard of Loic before I met him. People were talking about the guy who traveled from the UK to Bali without flying because his son had wanted to spend a year at Green School and neither of them wanted to impact their carbon footprints through air travel. turns out that adventure was just the tip of the iceberg for this story. Contentment is not conditional, happiness is. You need flow and we can all access this. Go through small talk but quickly go deep if the other person is open to it. Today’s guest Life Athlete is Tijana Momirov. Tijana has been a digital nomad for years. Her brand follow the elements isliterally how she lives her life. She’s a windsurfing, kite surfing, computer programming, people inspiring, fancy dress wearing, dynamo who is set to host a co-working, co-adventuring, co-living retreat in Brazil. Focus on the moment. Always remember that life is a journey not a destination. Have a structured life where you follow certain patterns wherever you go. This will allow you to be productive and to feel at home wherever you happen to be. Intuitive, energetic. At the same time, very rational. Relax, open up and think about something that you would love to have your life. Make a rational, logical, practical plan for how to get it. Today’s guest Life Athlete is Rodolfo Young. Rodolfo is and has done many things. Among them, he spent a year in silence to recover from heart ache. He gives heart talks around the world, wherever he goes. He has given a TEDx talk on holding space and he gives hugs that people go out of their way for. He also has a lovely speaking voice. Enjoy!